Large sandstone headstone marking the site of the cemetery and commemorating the pioneers of the Forest Creek goldfield who are buried there. Over 200 children are buried from the goldrush days of 1852-1857 in the children's cemetery. The cemetery was restored and fenced in 1929. On 20 July 1851 Thomas Peters, a hut-keeper on William Barker’s Mount Alexander station, found specks of gold at what is now known as Specimen Gully. This find was published in the Melbourne Argus on 8 September 1851, leading to a rush to the Mount Alexander or Forest Creek diggings, centred on present-day Castlemaine, claimed as the richest shallow alluvial goldfield in the world. 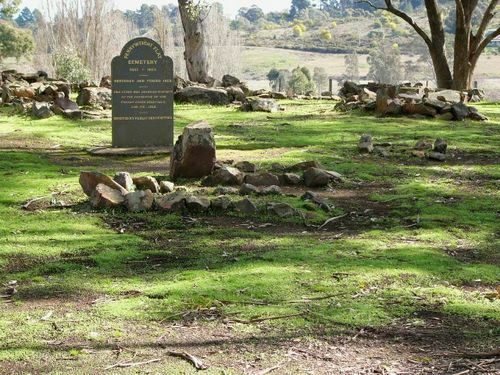 Through the combined efforts of the Old Castlemaine Schoolboys' and Old Pioneers' associations, supplemented by public subscriptions, the old cemetery at Pennyweight Flat, which for years had been neglected, has been reclaimed. The cemetery was known as the children's cemetery, but a number of adults were also interred there. Some of the inscriptions on the headstones are well preserved, and records show that interments took place during the period from 1852 to 1857. Senator Lawson, Mr. J. B. Field, Cr. G. 0. McLean, an ex-mayor of the shire, and many of the oldest residents of the district took part in the unveiling of a memorial stone on Sunday. Age (Melbourne), 28 January 1930.